With warm and trendy decoration and a seating capacity of 150 persons coupled with additional 9 VIP rooms, the JadeLink Garden Chinese Restaurant is able to satisfy various demands of business functions, both in food quality and services. The hotel’s Executive Chef comes from Hong Kong, specializes in traditional Cantonese cuisine and seafood dishes. The restaurant offers a large selection of Hong Kong style Dim Sum, Cantonese cuisine, seasonal specialties and signature dishes which are second to none in town. Shanghai cuisine delicacies and specialties from other provinces of China are also available to meet guests’ demand of different favors. Each VIP room has a private restroom for guests who prefer more privacy. 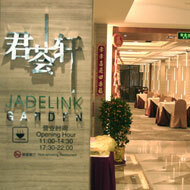 The JadeLink Garden Chinese Restaurant is located on the second floor of the hotel. The Link Café at the hotel lobby floor offers sumptuous breakfast buffet featuring European/American, Chinese and Japanese favors. For lunch and dinner, the a la carte menu selection includes a variety of international and western cuisine of high quality from light food to formal entrées. Our mouth watering desserts are a must to round off truly memorable dining experience. Located next to the Link Café, the J Lounge is an ideal place to meet business partners and to conduct meetings in a relaxing atmosphere or meeting friends for a nice get-together throughout the day. The large variety of beverages of your choice, including cocktails, beers and an excellent wine selection complimented with quick snacks, makes the J Lounge a unique place to revive after a successful day of business or having exhausted after leisure tours to local attractions. The Laurel Tea Room, located on the second floor, is a recommended place for you to explore the traditional art of appreciating Chinese tea for relaxation and health. Chinese tea ceremony can be performed on request.